Each year, the demand for cyber charter school increases. As this model of education grows, more and more parents consider if it would work for their child. 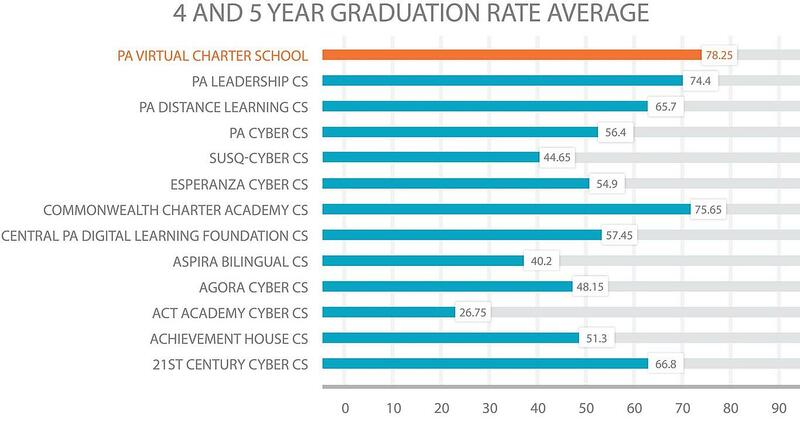 According to the Pennsylvania Department of Education’s 2017-2018 School Performance Profile results, PA Virtual Charter School (PA Virtual) is the top-performing cyber charter school in the state. PA Virtual has served thousands of students since being founded in 2001. As experts in this field, PA Virtual is a trusted resource for families exploring this choice. Parents enroll their children in this model for a number of reasons. They may be interested in actively participating in their child’s learning. Other parents are looking for a more personalized education; they want a school that offers their child individualized support or more of a challenge. Other parents enroll to provide their child a safe, distraction-free learning environment. Every child deserves an education that suits their needs and learning style. PA Virtual has prepared this guide to help families research, learn, and make a choice that is right for them. Making the decision on which model of education works best for your child is very important. If considering the virtual education model, bear in mind that virtual education is better suited for students who are independent learners, are motivated with good time management, and are actively engaged in local social activities. Consider the factors below when deciding if a cyber charter school is the right fit for your family. How Do Cyber Charter School Students Socialize? Prospective parents often ask how students socialize in a virtual school environment. 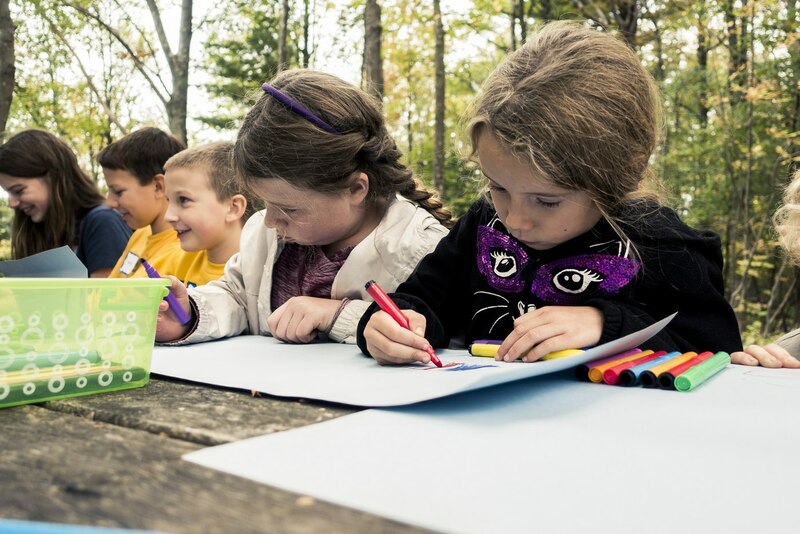 As socialization is a crucial part of a child’s development, we offer plenty of opportunities for students to interact with their peers outside of the classroom. Our Family Support Coordinators organize fun and educational field trips across all regions of the state each month. PA Virtual also has over 15 clubs where students meet virtually on a regular basis based on common interests. 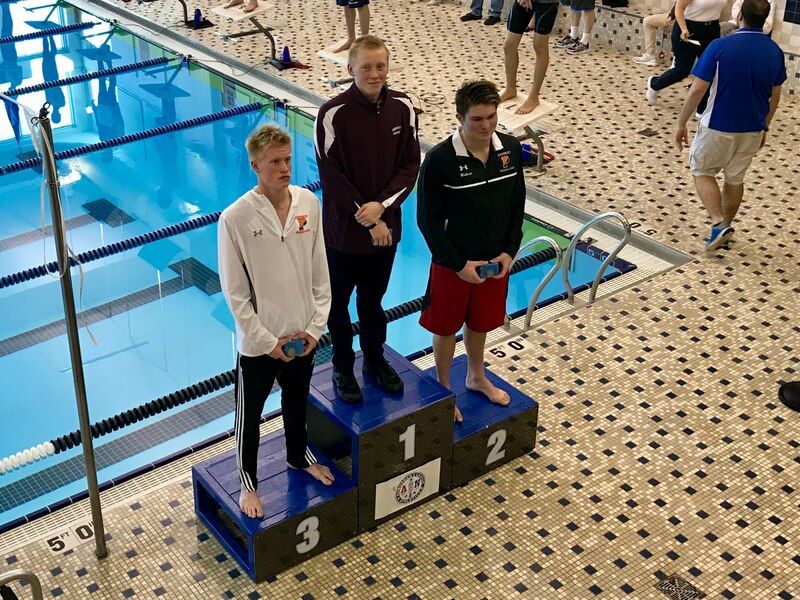 Additionally, students may choose to participate in their local school district’s extracurricular programs such as athletic teams and social clubs. Another concern we hear from parents involves how cyber school students perform on state-mandated tests and assessments. 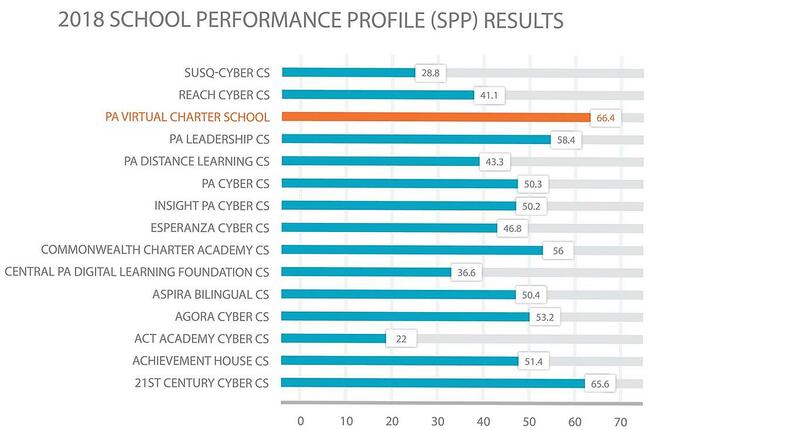 Based on the School Performance Profile results released by the Pennsylvania Department of Education in December of 2018, PA Virtual is the top performing cyber charter school in Pennsylvania. This success can be attributed to the dedication of our parents, teachers, and support staff, and to the academic diagnostic tools we use. 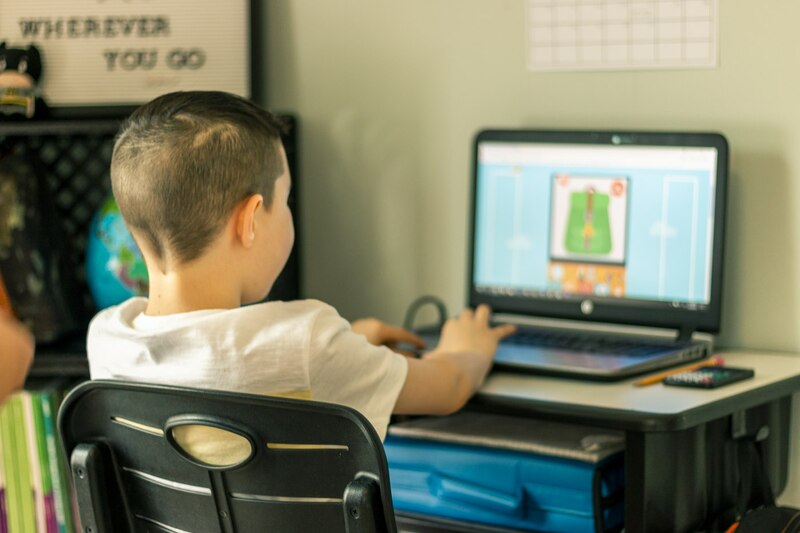 Our school resources include Study Island and Exact Path, which both allow our teachers to determine students’ needs and support their academic growth. Once a student enrolls at our school, we provide them with all the necessary technology to support the learning process, including a laptop and printer/scanner. Since students utilize technology frequently in this model, there are plenty of breaks scheduled throughout the school day. 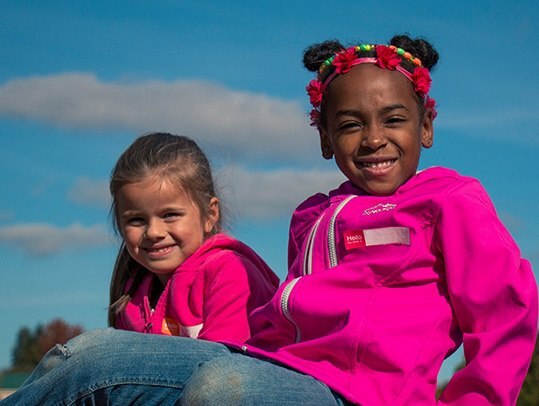 These breaks give students time away from their computer screens and an opportunity to get outside to get some fresh air, especially when the weather is nice. Additionally, it’s important to note that our teachers do assign some coursework that is hands-on, including science experiments and workbook assignments, which offer our students a well-rounded experience. At PA Virtual, Fridays are designated as asynchronous which means that students are expected to complete assignments independently on that day. Families and students can attend scheduled outings in their area as their academic schedule permits. 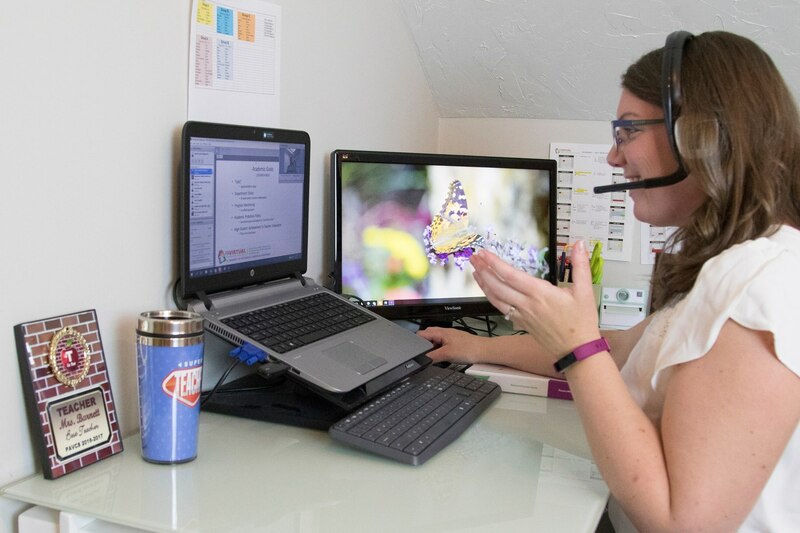 Although parents are heavily involved in their child’s education in this model, the PA Virtual teaching staff is comprised of over 100 state-certified teachers. Our teachers are dedicated to student success. Whether it’s instructing students directly in live classes or providing students with lesson plans, assignments, and individualized feedback, our teachers work with each student to ensure lessons are understood and concepts can be applied outside of class. We offer both Academic Support and Family Support to our families. Our Academic Support includes Academic Support teachers, Guidance Counselors, Student Assistance Program, New Student Onboarding and Orientation, English Language program, 504 program, Special Education program, and more. Being a Learning Coach can be challenging, but we offer ongoing supports and resources so that it can also be very rewarding. Read more about the support services we provide in the sections below. Click below for your interactive copy of this guide so you can print or save for future reading. "My teachers helps me by showing me new things. At PA Virtual, I enjoy meeting new kids." How Do You Know if Your Child Would Benefit from a PA Cyber School? You may be asking yourself, how do I know if my child will benefit from a PA cyber school? This is a crucial question when determining the next steps in your child’s educational future. Please read some of the reasons our current families enrolled and have found success with our virtual model. Our parents - Learning Coaches - are a foundational element of the school’s model. The Learning Coach is crucial to a student’s success. As a Learning Coach, parents actively participate in their student’s education by partnering with teachers and support staff to ensure daily progress and academic achievement. PA Virtual requires that a Learning Coach remains at home with the student while the student is attending school in order to provide academic support to the student. The involvement and support of the Learning Coach varies based on the age and the need of the student and relies heavily on open lines of communication between the Learning Coach, student, and teacher. For parents that want to be involved with their child’s education on a daily basis, the role of the Learning Coach is the role of a lifetime. Our school model is designed to assist each child in reaching academic success. Our model approaches teaching and learning for each student by partnering with parents and students to determine how to best meet the individual needs of every child.The school principal ensures that teachers partner with our parents to provide instruction, helping to ensure that the student receives the individualized education that will help them to be academically successful. If you are looking for a structured schedule that meets at certain times each day, then synchronous classes may suit your needs. While a Learning Coach is still essential for synchronous classes, the courses offer the benefit of live, real-time teacher interaction and instruction.The virtual classroom is organized in an electronic platform known as Blackboard. In synchronous classes, teachers and students interact verbally, as well as by using an interactive whiteboard, chatbox, emoticons, microphones, instant messaging, webcams, and other online tools. Students who follow a primarily synchronous plan will still have some asynchronous classes and lessons to complete, with the help and guidance of their Learning Coach. If you are looking for a slightly more flexible schedule, then asynchronous classes may better suit your needs. Students have a customizable schedule in a self-directed environment. Their day is managed by the adult at home – the Learning Coach – but their academic work is planned by a certified teacher. The teacher supervises academic progress and is available to support their students' needs daily. Students must meet the prerequisite program criteria to participate in the asynchronous model as outlined by each school. PA Virtual offers an array of opportunities and experiences available through Student Clubs and Activities. Joining or starting a club or activity is a fun and easy way for students to get involved in our online community as well as explore new and favorite interests. Whether a student’s passion is for service or robots, anime or music, PA Virtual encourages them to join or start a club or activity that is of interest to them. Our clubs and activities are student-run and provide a range of leadership opportunities for the student participants. PA Virtual believes the responsibility of educating your child is a team approach. In addition to your partnership as the Learning Coach, PA Virtual provides the tools and services students need to succeed - inside the classroom and outside in the greater community. Family Support Coordinators (FSC) are assigned to each family to provide consistent one-on-one support throughout the school year. FSCs are responsible for monitoring daily student attendance, providing support with technology tools, coordinating field trips and other socialization opportunities and helping families navigate through all non-academic aspects of the school. Think of FSCs as your personal guides to all things PA Virtual. Parental Involvement and Engagement is at the core of PA Virtual, and we have a staff dedicated to this goal. Our school is designed to support parents as Learning Coaches for their children. We help parents achieve their academic and social goals for their children by offering opportunities for parent education and engagement. We enhance our parent’s knowledge and education by providing resources, weekly online sessions, parent certificate programs, and an optional mentor program. School Health Services are available to all enrolled students to support their health, wellness, academic growth, and achievement. Guidance Staff provide students with academic planning, college and career information, financial aid and scholarship information, as well as character building, strategies for classroom success, study skills, and more. New Student Onboarding and Orientation will enable all new families and students to successfully transition into the virtual, online learning model. PA Virtual’s comprehensive program is a two-week exercise intended to help parents and students learn how to get the most out of their online learning experience. PA Virtual will provide students who are English Learners (ELs) with English language instruction by a qualified ESL/Bilingual Education Teacher. The Student Assistance Program (SAP) is one of the available supports PA Virtual provides to students. The primary goal of SAP is to link students with the help they need in order to overcome barriers so they can remain in school, succeed academically, and work towards graduation and post-secondary success. We hope this information was helpful to parents who are considering if their child would benefit from PA cyber school. For more information on PA Virtual, please check out our website and feel free to request more information. One of the greatest assets PA Virtual has is the diverse background and experience of our teaching staff! We have over 100 state-certified teachers in locations all across the state, and many have both cyber and brick-and-mortar teaching experience. Nine of our teachers were nominated for 2020 Pennsylvania Teacher of the Year! PA Virtual teachers have an average of eight (8) years of service to our school. Some of our teachers are new to the PA Virtual family, and some of them have been with us since we opened our virtual doors in 2001. But no matter how long they’ve been here, all of our teachers share a passion for teaching at PA Virtual! This is a sample of just a few of the many wonderful teachers at our school. Explore their bios below. 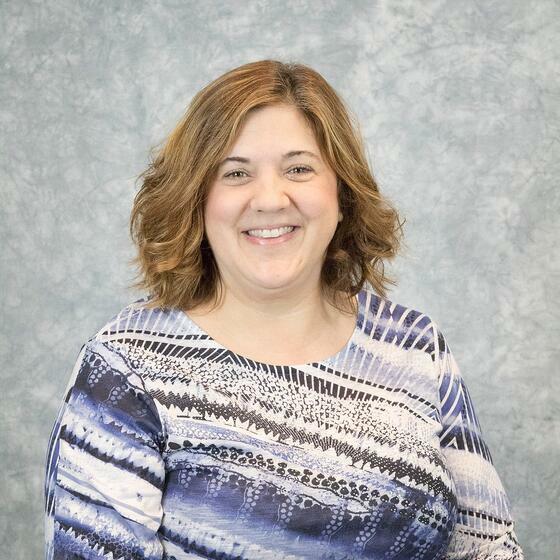 Check out the “Meet Our Team” page to view all teacher photos and fun facts. Fun Fact: Jackie named her children (Jack and Reilly) after her father, Jack Reilly. Fun Fact: I lived for 14 years in Europe, in 3 different countries: England, Turkey, and Germany. Fun Fact: I added 3 extra hours to the year 2018! I spent the New Year’s holiday in California so with the time change, I technically had 3 extra hours that year. It was beautiful to watch the last sunset of 2018 over the pacific ocean in Malibu. Our teachers bring a wide array of talents and interests to our community and make PA Virtual a great place for you and your student to learn and grow. Want more? View the virtual profiles of Elementary School teacher Katie Barnett and High School teacher Tamara Bacon below. PA Virtual’s state-certified teachers lead students through their studies using the nationally recognized K12, Inc. curriculum. Just like at your local school, teachers use their creativity to individualize lesson plans and add variety throughout the year. 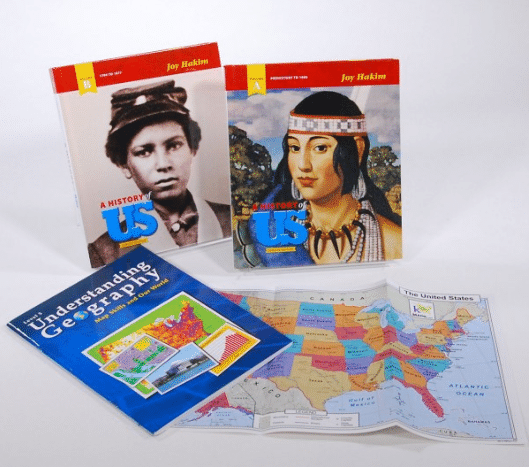 The K12, Inc. curriculum consists of online lessons, books and workbooks, Learning Coach Guides, and supplemental materials. Students in grades K-4 take courses in Math, English/Language Arts (ELA), Science, History, Art, Music & Physical Education. You can review and download course descriptions by grade level here. 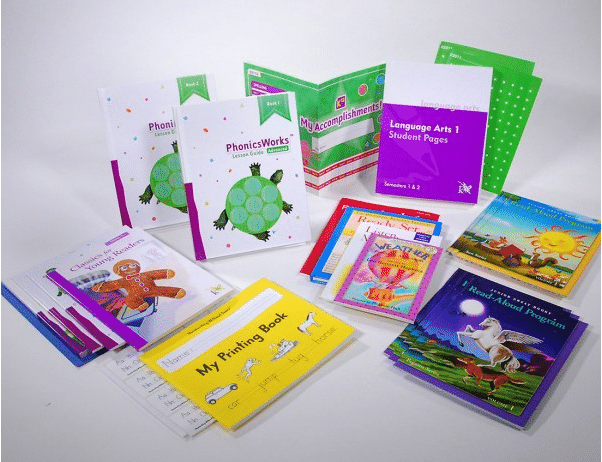 Here’s an example of what first grade students receive for their ELA curriculum. Want to see an online lesson in action? Click here! Students in grades 5-8 take courses in English/Language Arts (ELA), Math, Science, American & World History, American & World History Art, Music, Health & Physical Education. You can review and download course descriptions by grade level here. Students in grades 9-12 take a variety of courses in core subjects as well as electives. You can review and download our high school course catalog here. 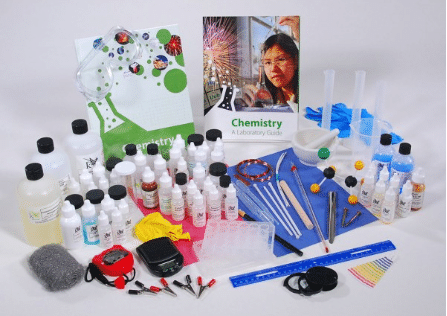 Here’s an example of what high school students receive for their Chemistry curriculum. These are all great examples of how lively and engaging the K12, Inc. curriculum can be. Keep in mind that while these courses provide the foundation for learning at PA Virtual, your student’s curriculum and schedule will be based on his or her needs and will reflect the expertise and creativity of his or her teacher. Starting a new school can be overwhelming, especially when that new school is unlike anything you’ve ever done before. Parents and students have many questions, like what their responsibilities will be, what a typical school day looks like, and how many hours a day they are expected to complete school work. At PA Virtual, families and administrators work together to answer those questions by deciding what type of instruction best fits their student’s needs: synchronous or asynchronous. Synchronous courses are led by PA-certified teachers; students attend live classes with their peers across the Commonwealth. Asynchronous courses provide students the opportunity to move through their courses in a more self-directed manner, with the supervision of PA-certified teachers. Teachers plan the student's coursework and are available to support students daily. Both models require dedication and assistance from the Learning Coach, although the level of involvement can vary somewhat by grade level. Elementary school establishes the educational foundation for young learners. At this stage of their educational journey, students begin to think critically, problem-solve, and manager their learning time; all skills that will help foster future academic success. Families with elementary-level students should expect the Learning Coach to be very hands-on. Learning Coaches of elementary students will sit alongside their child during live, teacher-led lessons. After live lessons are complete, the role of the Learning Coach is to guide the child through their assignments and online lessons, enhancing concepts as needed. Students are expected to receive 5 hours of direct instruction per day. Direct instruction is comprised of instructor-led classes and independent work guided by the Learning Coach. Students receive live instruction from teachers in synchronous classes.Teachers also direct students to work with their Learning Coach to complete lessons in the online school. Additionally, the Learning Coach will guide their students through the asynchronous courses offered at the elementary level (Spelling, Vocabulary, Art, Music, and Physical Education; and at some grade levels, Phonics, History and Science). Middle school continues to build on the educational foundation of students. At this stage of their educational journey, students continue to hone their critical thinking and problem-solving skills. Middle school students engage and participate in classes under the supervision of their teachers, using discussion boards, podcasts, videos, webcams, wikis, and other forms of communication. At this stage the students become more independent and begin to actively manage their learning time - they are encouraged to begin taking ownership of their education. Teachers provide students with a syllabus outlining assignments and due dates to help them stay on track. Parents should expect their middle school student to receive 5-5 ½ hours of direct instruction per day per day, regardless of whether they are in synchronous or asynchronous classes. Direct instruction is comprised of instructor-led classes and independent work guided by the Learning Coach. Hours will vary based on a student’s individual needs and program requirements, and additional hours may be needed for students who attend academic support or tutoring classes. In general, however synchronous students will attend classes up to 4.5 hours a day, with the remaining hours used to complete independent work. Learning Coaches with students in synchronous classes should be available to keep an eye on students while they are in class, and will need to dedicate additional hours each day for asynchronous work. Learning Coaches with asynchronous students should be available to monitor students while they complete their schoolwork and will need to dedicate approximately 5-5 ½ hours each day. PA Virtual high school students prepare for their future journey to work and post-secondary education. Students learn techniques to manage their time, solve problems, take personal responsibility, properly use information and communication technology, and gain global awareness. Each academic year, high school students are required to take a minimum of 5.25 credits. Students receive hours 5 ½ hours of direct instruction per day, for a total of 990 hours by the end of the school year. Direct instruction is comprised of instructor-led classes and independent work. On average, synchronous students spend 3-5 hours per day attending their 3 live classes, and dedicate 1- 3 hours a day to independent work. Asynchronous students dedicate the entire 5 ½ hours each day to independent work in lieu of attending live classes. Complete a Graduation Project during their senior year. Options for the project include but are not limited to: job shadowing, volunteering, or writing a research paper. The Guidance Department at PA Virtual works closely with students in selecting courses, planning their academic futures, and advising them in career and college options. Throughout the school year, high school students are invited to participate in monthly presentations on different topics such as college applications, financial aid, and scholarships, as well as workforce, military, and vocational/technical opportunities. Guidance Counselors also hold senior reviews with every student to discuss their post-secondary plans and help them work towards their goal. For example, they can help students who are college-bound complete applications. For students interested in immediately entering the workforce, counselors can help create resumes, find job fairs, and provide helpful interview tips. Military-bound students get support in connecting with their branch of choice or local recruitment offices, and students interested in vo-tech programs get help finding a school that will meet their interests and needs. Starting a new model of education with PA Virtual Charter School can be challenging for both parents and students. 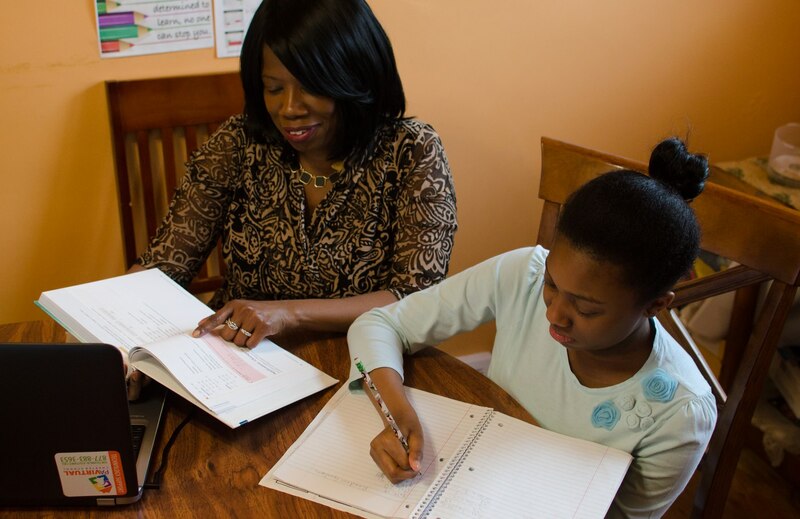 While the instruction process for each family differs depending on the grade and mode of instruction, school administrators work hand-in-hand with families to ensure each student has the potential to succeed, opportunities to overcome challenges, and access to a curriculum that doesn’t overwhelm them. Parents will find their students are most successful in a cyber charter school when they are partners in the educational journey and actively work with our staff to support them every step of the way. There are 15 cyber charter schools in Pennsylvania. These schools have a few similarities and many differences. Per the PA Department of Education (PDE), a cyber charter school is an independent public school and a non-profit organization that uses technology to deliver a significant portion of curriculum and instruction. Cyber charter schools are established and operate under a charter through the Department of Education. The differences between schools are vast, and this section focuses on providing data to help families learn some of the key differentiators. PSSA/PASA/Keystone performance, industry standards-based competency assessments, grade three reading proficiency, and SAT/ACT college ready benchmarks. All student scores are used to define how well a school is making progress toward proficiency of students. Historically Underperforming Students scores are used to define how well a school is making progress towards proficiency of those students who have historically not demonstrated proficiency. Measures the school’s impact on the academic achievement level of groups of students from year to year. Other Academic Indicators – Assesses factors that contribute to student achievement, such as graduation rate, promotion rate, and attendance rate. 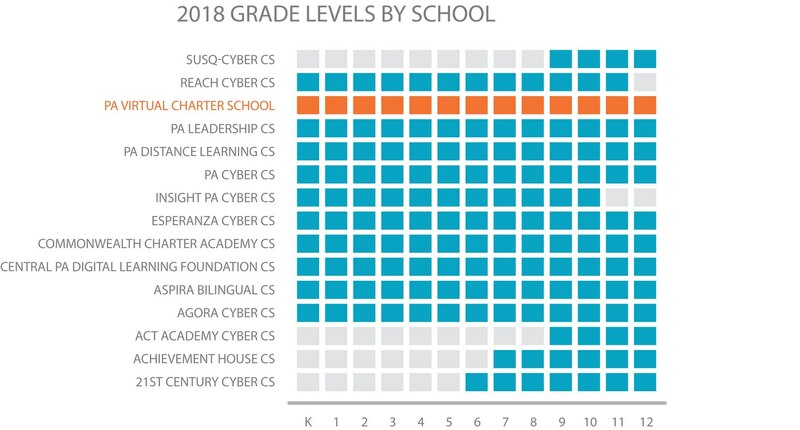 The data provided on this page focuses on PA cyber charter schools scores, based on the PDE 2018 SPP Results. PDE explains that these scores are designed to help inform the public of school performance and allow them to compare schools, while also providing a score for educators to use as part of their evaluation system and a methodology to analyze their strengths and needs. While SPP scores are no longer used to inform the public about the academic performance of each school (that is now done through Future Ready PA Index), the SPP still serves to provide building levels scores for educators as part of the Pennsylvania educator effectiveness system. We are proud that the hard work of our students, parents, and teachers has ranked PA Virtual with the highest SPP score of cyber charter schools in 2018. Pennsylvania Value Added Assessment System (PVAAS) is a statistical analysis of PA state assessment data, helping educators ensure they are meeting the academic needs of groups of students. Schools and teachers are using PVAAS growth data (in conjunction with achievement data) to make sure students are on the path to proficiency and beyond. PDE explains that growth data measures a student group’s growth across time, and compares the performance of a student group to their own prior performance. 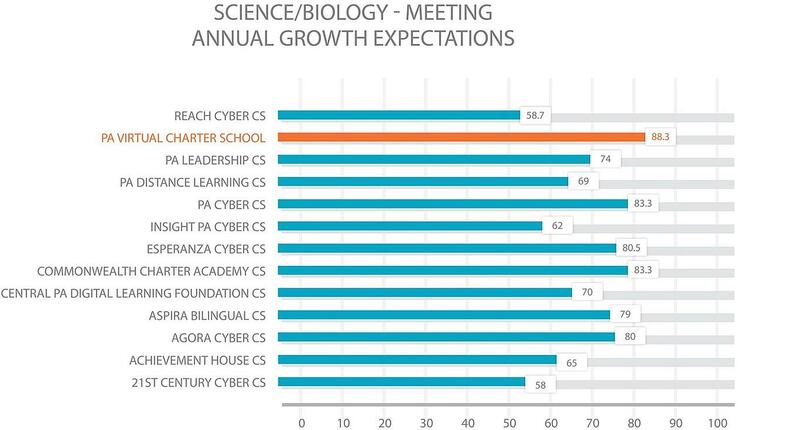 Review the subject-specific data below for cyber charter schools Meeting Annual Growth Expectations. 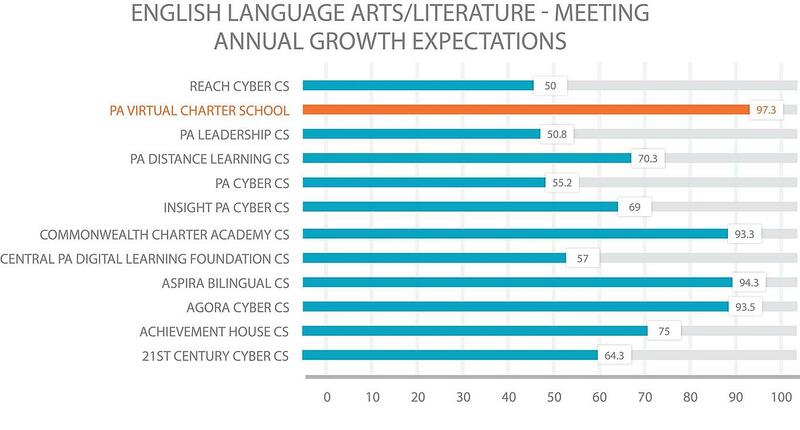 PA Virtual is pleased to report the highest Annual Growth Expectations among PA cyber charter schools in both English Language Arts/Literature and Science. 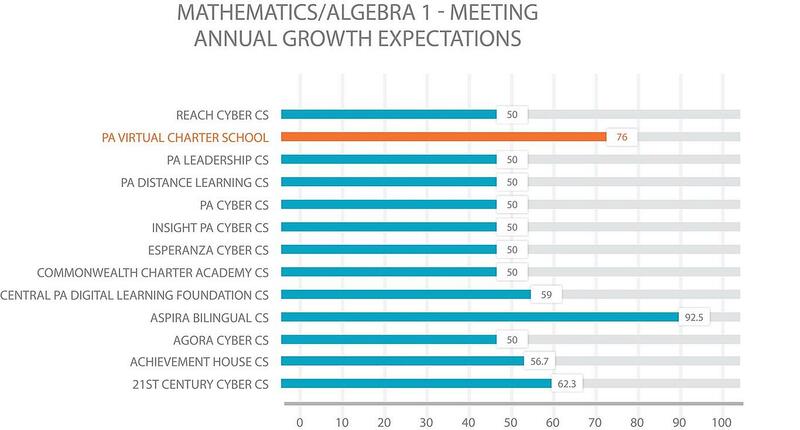 PA Virtual had the 2nd highest Annual Growth Expectations among PA cyber charter schools in Mathematics/Algebra I. There are so many choices in where children go to school, because every child has unique needs and may thrive in a different environment. Parents likely consider many factors when choosing the right school for their child. In Pennsylvania, parents can choose a cyber charter school as small as under 100 students, or as big as almost 10,000. Some factors to consider when parents are looking at school size are class size, attention to students, community, academic achievement, and curriculum. PA Virtual Charter School families have the best of both worlds - small enough that our students can master the curriculum in smaller class sizes, paired with strong parental involvement and a true sense of community, yet large enough that students have a wide variety of courses, services, and social opportunities available to them. Cyber charter schools receive their charters through the Department of Education. These charters establish the grade levels offered at the school. As you can see from the Grade Level chart below, not every school offers every grade level. As you are choosing the right school for your child, this information will play a crucial role in your choice. PA Virtual Charter School offers every grade level from kindergarten through 12th grade. Our school is separated into 3 smaller schools, or learning communities - Elementary School (Kindergarten - 4th Grade), Middle School (5th Grade - 8th Grade), and High School (9th Grade - 12th Grade). Each school is overseen by a Principal, Assistant Principal, and has individualized support services. High school graduation rates can be an important indicator of a school’s success. All public schools in the state provide their graduate data through the Pennsylvania Information Management System (PIMS), and that data is used to calculate Graduation Rate. Below you can see data from the Future Ready PA Index from 2018 for both 4 and 5 year graduation rates, as well as an average of both. 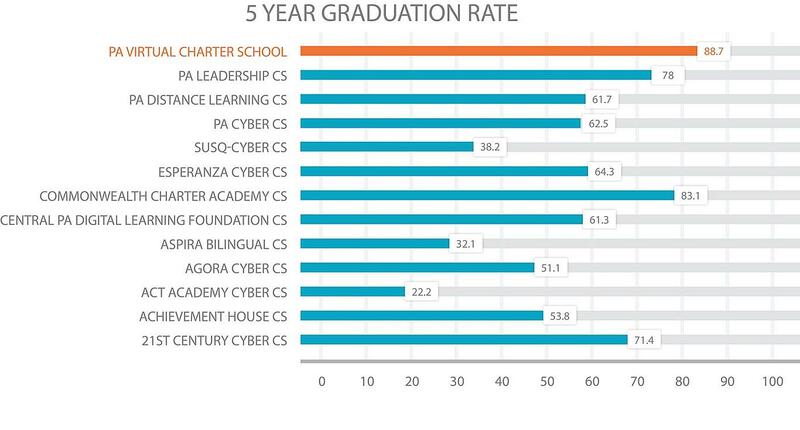 PA Virtual is proud to have one of the highest 4-year Graduation Rates, as well as the highest 5-year Graduation Rate and highest 4 and 5-year Combined Graduation Rates of all the cyber schools in the state. We hope this section comparing all 15 cyber charter schools in Pennsylvania will help you as you research the best school for your child. 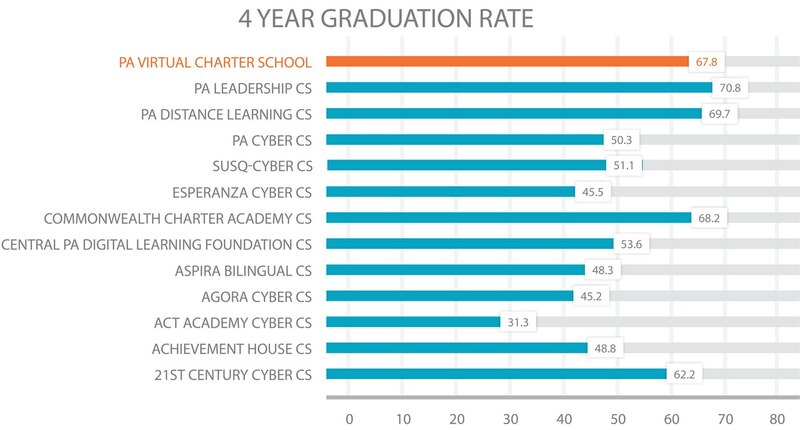 While PA cyber charter schools are chartered and monitored through the PA Department of Education, every school is independent and the differences are vast. Make sure to consider all of these factors as you make a choice. When parents decide to research cyber school as an option for their child, they usually have many questions. One popular question we hear at PA Virtual is “How will a PA Virtual education prepare my child for post graduation?”. PA Virtual high school students complete a graduation project which gives them real-world experiences whether that be through job-shadowing or research. In addition, each and every day, through instruction and supports, our teachers prepare students to successfully transition out of high school as independent lifelong learners. PA Virtual prepares students for life after graduation in several ways. One tool PA Virtual Guidance Counselors use is called Naviance. Counselors will ask students in as early as 7th grade to start thinking about what kind of college or trade school they would like to attend. Questions such as: “Would you prefer a large school or a smaller school”, “Do you want to go to a school close to home or look outside of the state”, and “What do you think you would like to major in” all help the system to create a personalized list of schools that would best match the student’s interests and needs. Our guidance team even helps schedule virtual and on-campus visits! Because students’ wants change as they get older, counselors conduct this exercise every year and give students a list of schools to look into that fit their specific profile. PA Virtual doesn’t stop with finding a good education fit - they also help families find ways to afford it, too. Our guidance team holds financial aid awareness assemblies for any student looking to help fund their post cyber school education. Our high school guidance team also offer financial aid presentations in the evening to cover specific questions and help students avoid typical stumbling blocks that families come across when applying for financial aid. As far as one-on-one time, our counselors conduct senior reviews to make sure that students are not only on pace to graduate, but are also on track to get accepted into the school of their choice. These steps have produced impressive results. Not only do over 70% of our students choose to attend a post-secondary school, but the 2018 graduating class was offered over $1M in scholarship funds! Every student has a Guidance Counselor who assists with helping students figure out what path they want to pursue after they graduate. For students interested in immediately entering the workforce, counselors help create resumes, find job fairs, and provide interview tips. Military-bound students get support in connecting with their branch of choice or local recruitment offices, and students interested in technical college get help finding a school and career-path that will meet their interests and needs. Whether it is helping students choose a career path or college, prepare for the workforce or military, or earn as much scholarship money as possible to make their post-graduation dream come true, our counselors steer PA Virtual students in the right direction, cheering them on as they travel down the path to future success. 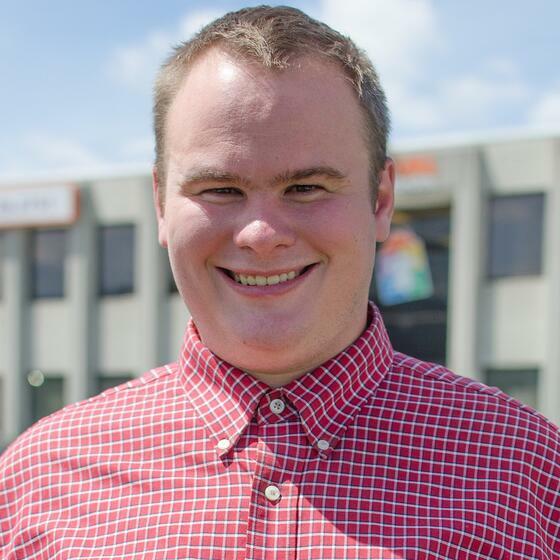 But don’t just take our word for it, listen to PA Virtual alum Elias Harkins as he shares what he’s been up to since graduating in 2013. 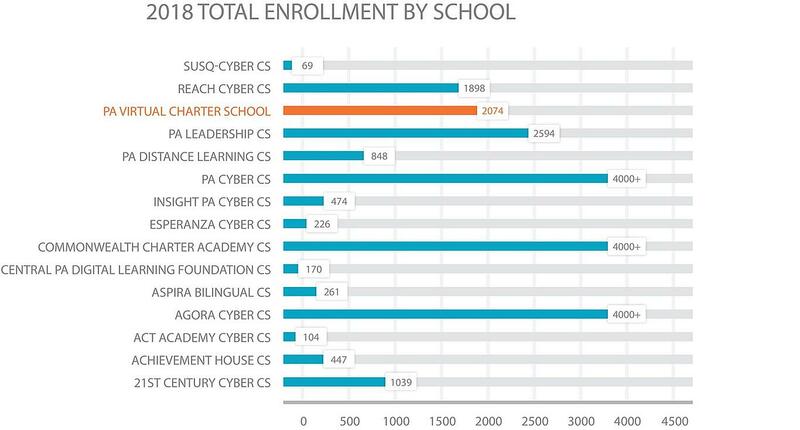 What is the Enrollment Process Like for Cyber Schools in PA? Join our PA Virtual school community of over 2200 students! We provide students with an excellent education, grounded in high academic standards, which will help them achieve their full academic and social potential. Our 4-step enrollment process is easy and we will help to guide you through. PA Virtual enrolls school-age students, as defined by the PA Department of Education. This includes students from the age of 5 through 21. To enroll in kindergarten, children must meet the age requirements of their resident school district. In addition, students must be a resident of Pennsylvania. Since we are a public school, there is no cost or tuition fees to enroll. Enrolling in a cyber school is a big step and we want you to have all the information that you need to decide if this is the right fit for your child and family. To help you make that decision, your first step in the Enrollment Process is to have an introductory phone call with an Enrollment Specialist who will explain our model of education and answer any questions you may have. If you decide that PA Virtual will be a good fit for your family, we will explain how to start your online registration and submit the required documents. You will receive a personalized email with the link to the registration form, which should take 10-15 minutes to complete, as well as a list of documents to submit with the fax or email address for submitting them. We will also provide you with the enrollment forms required by the PA Department of Education, which you complete online and submit electronically. After you complete your online registration and submit your documents, the Assistant Director of Enrollment will call you to complete the Enrollment Conference. During this call, we will discuss the specific requirements and expectations for our school and for your child’s grade level and also explain your role as the Learning Coach. In addition, we will talk about the specific needs of your child so that this information can be shared with our Academic and Family Support Teams. Sharing this information will help them to provide support to your child from day one. We will confirm your child’s start date with PA Virtual and withdrawal date from their current school. After the Enrollment Conference, it is your responsibility to contact your current school to provide them with your start and withdrawal dates. Your child should remain enrolled in their current school until the enrollment process is finalized. And the final step in the enrollment process is Orientation! You will receive your child’s school-issued laptop before Orientation starts. During this two-week program, you and your child will be actively engaged in online sessions with your Orientation teacher. Our Orientation teachers introduce you to our online tools and academic programs and help ease your transition into this virtual model. We believe that providing this opportunity to learn about our various online systems, our organizational structure and academic programs will help you to be successful at PA Virtual. Enroll early so that you are able to start the school year on our first day of school! Enrolling early will also give you time to set up your home learning environment. We also have open enrollment throughout the school year. Apply now to begin the enrollment process. 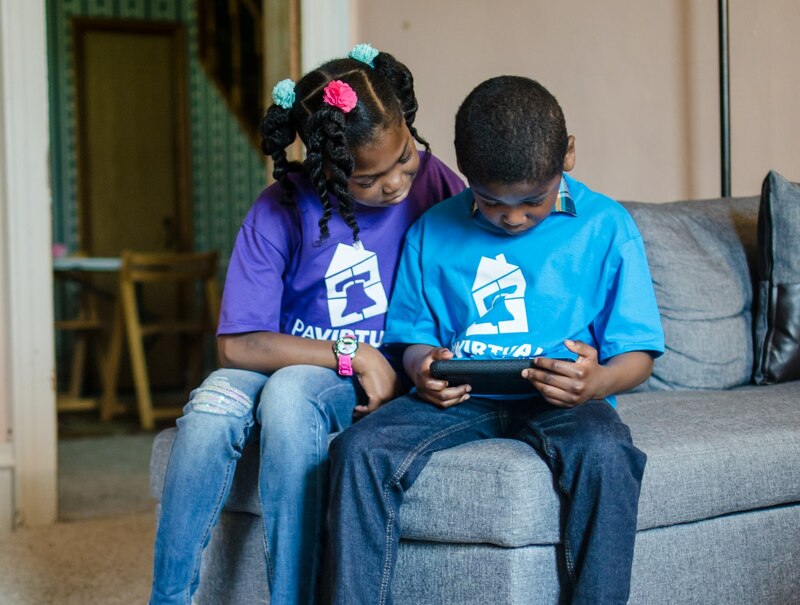 We look forward to helping you through the enrollment process and are very excited to partner with you as your child starts their educational journey with PA Virtual! Cyber charter schools offer flexibility to students and their families. Our asynchronous mode of instruction provides an opportunity for families to customize a student’s schedule that works best for them, allowing students to complete work at their own pace. Additionally, because cyber charter schools are public schools, there is no cost to attend, and all academic materials are shipped directly to each family’s home. Students graduate with a high school diploma just like students at your local district school, and they are equipped with the skills and preparedness for the next step after graduation, whether that is furthering their education or entering the workforce. *As a public school, PA Virtual is funded by Pennsylvania Taxpayer dollars. “We are happy with being a part of PA Virtual because we have been welcomed from day one by all of the lovely staff members who are as passionate about teaching as we are about learning. Download a Copy of this Guide! This is a lot of information to digest, which is why we have created an easy way for you to download this page as a PDF and get a copy sent right to your inbox! I have been at PA Virtual since 2001. I love working with our new families as they start their journey with our school! I have been with PA Virtual since 2014, helping new families learn about our program and begin the enrollment process. When I'm not helping new families, you can find me sharing funny cat videos on Facebook, begging my husband for an alpaca, or attending Renaissance Fairs. 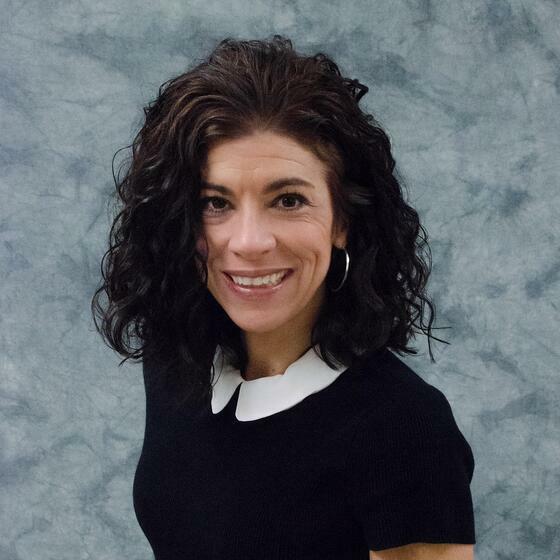 I've been with PA Virtual for 3 years as an Enrollment and Marketing Specialist. Before working with PA Virtual, I was a radio personality and producer. I’ve worked at PA Virtual for 10 years. I’m a school choice advocate and believe that every child can learn in an environment that’s right for them. I’m a dog lover and a corgi fanatic. I have been working at PA Virtual for a year and a half, supporting families throughout all stages of the enrollment process. A fun fact is I spent a year living and working abroad in Dublin, Ireland. I have worked for PA Virtual since 2009. I have played many roles at PA Virtual from Front Desk Administrative Assistant to Marketing and Communications Coordinator. I love that in each one of my roles, I get to know all of our students and their families! PA Virtual formed the perfect educational environment for me!